It’s been a while since I’ve brought you a story from the vaults of Dangerous Doug’s life. I like to reward my loyal readers from time to time so I arranged to have a chat to Doug and asked him to tell me about his army days. Oh yes, the Rhodesian Army saw fit to entrust our beloved friend with weaponry! At the time, all able-bodied young men were required to complete 12 months national service when they turned 18. 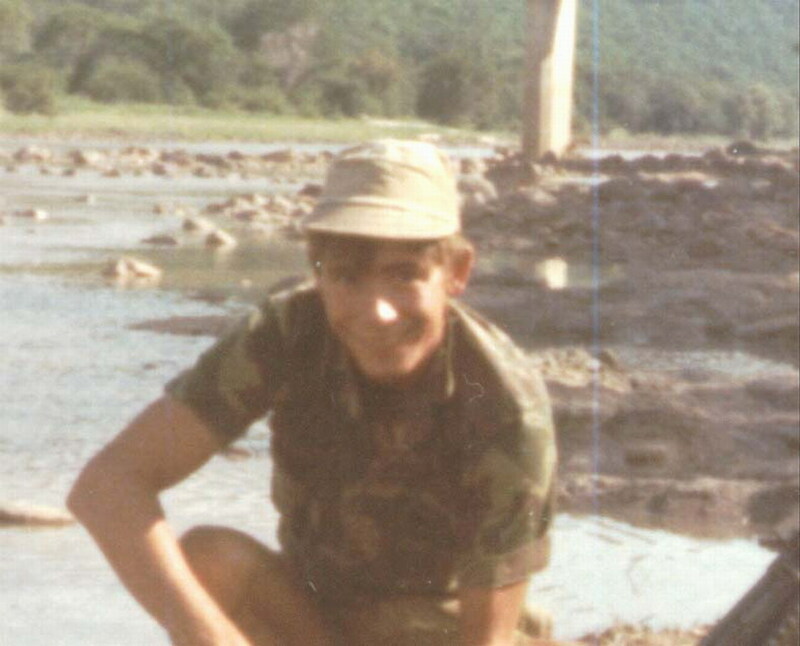 The nation was at war (Google it: Rhodesian Bush War) and the army needed all the help it could get to fight the black nationalists wreaking havoc and destruction throughout the country. Two weeks after his eighteenth birthday, Doug reported for service with just the clothes on his back and a small suitcase of personal belongings. He weighed 57kgs. Here’s Doug when he first started his army training at the tender age of 18. Adorable, right? As you can imagine, army life was quite different to anything Doug had ever experienced before. The training was gruelling. Counter insurgency training, weapons training, classical warfare training. Late nights, early mornings, surprise midnight drills, ill-fitting equipment, trench digging. All the while, carrying 20kg backpacks. As well as that, life was a lot more regimented, and the smallest infraction could earn a young private a “confined to barracks” charge, known as CB. This entailed countless drills, push-ups, chin-ups and other exhausting physical tasks meted out by the notoriously cruel MPs of the barracks. A CB charge was to be avoided at all costs. But being in the army wasn’t all drudgery. During his training, Doug got to play with a lot of pretty amazing weapons. Imagine being 18 years old and having the chance to use mortars, hand grenades, rocket propelled grenades, phosphorous grenades (that’s chemical warfare, people!) MAG machine guns, 7.62mm FN rifles, Claymore mines and other assorted armaments in a non-combat environment. Just three weeks into his training, Doug’s group had a mortar firing exercise in a remote field. Each young man was given the chance to fire a 20mm mortar shell from a hand held mortar. The aim was to hit a tree, about 1km away and whoever got closest would win four beers. Sounds like fun to me. As each of the other 29 privates had their turn, the area around the tree became scorched with all the explosions. It was, according to Doug, pretty damn cool. None of the guys was getting within 100 metres of the tree though. Studying each mortar as it flew up into the sky, topped out and then plummeted towards the ground he says he became fixated with the trajectories of the missiles coming down nose first. He became mesmerised by the image of each of those 29 mortars as they headed back to earth before exploding in a fireball. When, at last it was his turn Doug was certain that he was going to be the guy to obliterate the tree. The beers, and everlasting glory, would be his. He picked up his mortar, the last one, and was just about to release it into the tube, when SLAM!!!!!!! He was rugby tackled to the ground by the Sergeant. 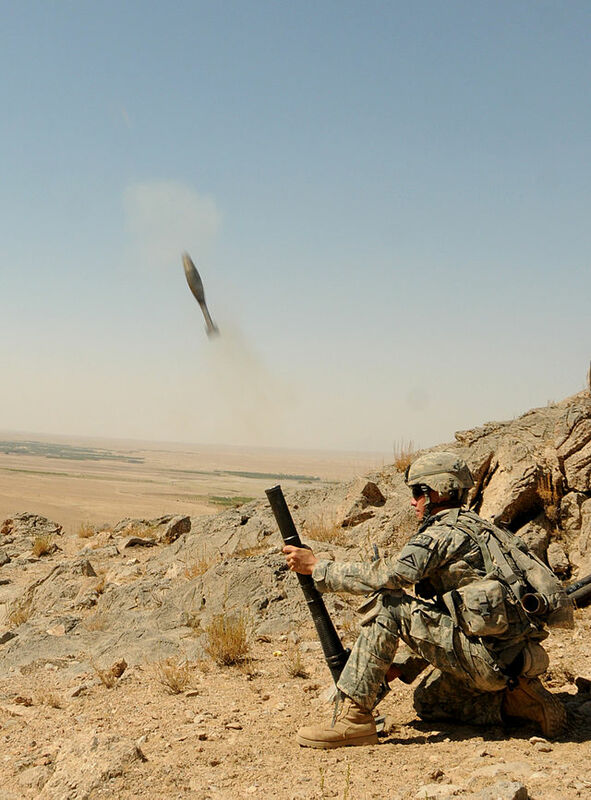 This is what a handheld mortar looks like. Indignant he got up and dusted himself off, only to be barraged by a string of expletives from his commanding officer, “You BEEP BEEP BEEPING BEEP. You could have BEEP BEEP BEEPING killed us all. You’re a BEEPING BEEP BEEP, whose mother BEEP BEEPS. What the BEEP is wrong with you?” Doug looked at the mortar, still in his hand, and with a sense of slowly dawning dread, realised that he’d been just about to place the mortar into the tube head down. If he hadn’t been tackled, the mortar would have exploded, instantly killing everyone. Sheepishly he apologised. He felt really bad. Bad that he didn’t have a chance to prove how good a shot he was. When he actually asked if he was still allowed to have his turn (oh yes, he asked), you can just imagine the Sergeant’s response. Suffice to say, we’ll never know if Doug’s aim would have won him those beers. Things kind of got back on track for Doug after this incident and he completed some pretty rough training to prepare him for war. One of the exercises the troops had to regularly participate in was night march training. This was basically a 10 mile hike in the wilderness of Zimbabwe in the middle of the night, usually in pitch black darkness. The men would trek, in single file along rough, unchartered terrain with nothing to guide them but their senses. Now as you know, “Dangerous Doug” earned that moniker for getting into all sorts of dangerous situations (and somehow surviving – thank goodness, right??). But DD is not his only nickname. Over the years he’s been known as many things, including Ugly Dougly (children can be so cruel), Hamburger, Volcano Face and Universal Gigolo (Doug made me say that last one). One of the nicknames he collected during his army days was “Pothole”. Somehow, during every single night time march he was on, even though the men hiked single file and Doug was always in the middle, he managed to fall into potholes that the others had missed. Every. Single. Time. After a while, the commanding officer had the bright idea to put Doug at the head of the line. After all, with the pothole magnet up front, at least the other men had a chance of avoiding them. Doug would stumble or fall, shout out “pothole” and the rest of the men would each, in turn, say “pothole”, “pothole” down the line. On one fateful night, four months into his army training, the men were called up for a midnight march. Doug led them into the night. Two miles into the hike he fell down a four foot hole. But he was OK. They managed to pull him out, and the march continued. Thirty second later, he fell again. This time over a ten foot rocky precipice. He was not OK. He had hurt his right leg pretty badly and couldn’t walk on it. The march was cancelled and the troop headed back to camp, with Doug carried home between two of his buddies. Back at the barracks he went straight to bed (which wasn’t really a bed but a sleeping bag in the dirt) and dreamt whatever it is that Doug dreams about (I don’t really even want to start imagining – but I have a feeling the words “Universal Gigolo” might provide a hint). In the morning, it came to the attention of the company’s CO, Major Makovich, that the evening’s march had ended prematurely, and when he’d found out that the reason was Doug’s little accident he wanted to have a chat to him. From the comfort of his deluxe director’s chair by his quarters, Major Makovich shouted out for Doug to get up and present himself. Doug’s leg had swollen up pretty bad but an order was an order and he managed to get up and face the Major, approximately 20 metres away from him. The Major demanded that Doug walk the distance and stand in front of him. I kid you not when I tell you that the 20 metre walk took Doug a full 20 minutes. I asked him to swear that he was telling the truth here because it sounds implausible. But he promises that it’s true. Each step on his hurt leg was excruciating and agonising pain, like a sharp, burning blade. And the major made him walk it, sipping his nice hot coffee the whole time. When Doug got to within 2 metres, Major Makovich finally had enough and told him to stop. He told him to turn around and present himself to hospital. He also told him that if there was nothing wrong with his leg, he was going to lay a big fat CB charge on him. Doug was taken to hospital where his leg was x-rayed. Lo and behold, his bone had completely snapped in two below the knee. The doctor, who happened to be a colonel, asked Doug, “Did someone make you walk on this broken leg?” Doug didn’t hesitate. He shook his head, no. He was in a cast for six weeks. During our chat, which lasted several shifts, Doug interspersed these amusing stories with other, more solemn, memories of his time in the army and serving his country in the war. My colleague has a history that has never even been hinted at in the five years I’ve known him. It is only through asking him to talk about the calamities in his life that I discovered this other facet to him. A Doug that, as a young man, patrolled the backwaters and villages of a country torn apart by terrorism trying to restore order against the insurgents. 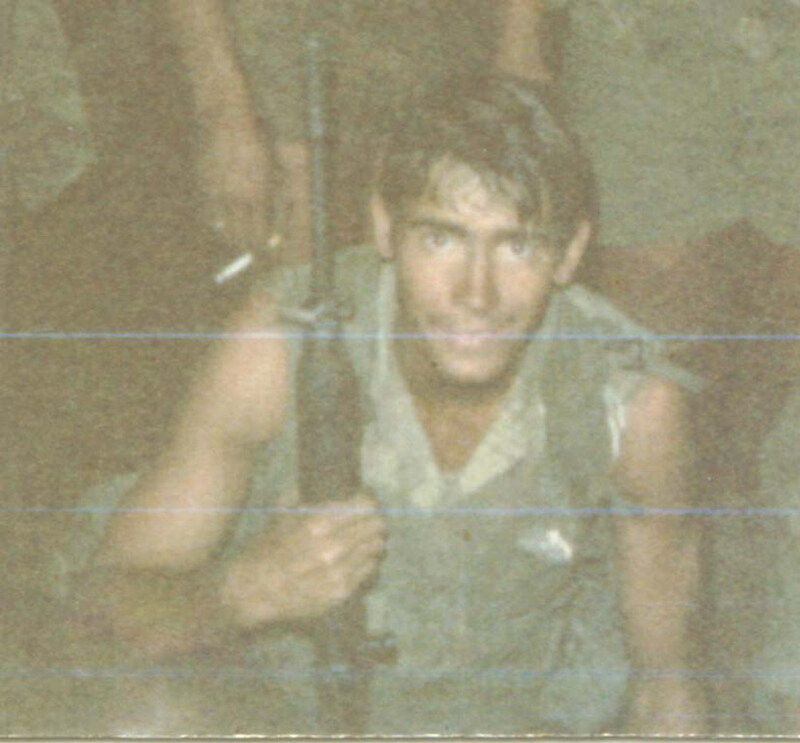 I discovered a Doug that was part of what Time magazine described as, “Man for man, the Rhodesian army ranks among the world’s finest fighting units”. A Doug that has seen the worst of mankind (the stories he told me about the war would make you lose faith in humanity), but also the best. I can’t help but look at him with fresh eyes now. With newfound respect. My friend, Doug. Here’s our man at 21 whilst serving in the war. Check out the biceps. And the hair, check out the hair (I can’t vouch for the biceps, but the hair is LONG gone!!!). With looks like that – I should be renamed Devastating Doug. 🙂 🙂 D.D. Indeed a new side to Dangerous Doug, I’m intrigued and could easily read more. Will there be a DD series?